Shark Takes a Bite Outta Seacrest! Ryan Seacrest isn't the new star of Discovery Channel's "Shark Week," but the Hollywood multi-tasker had his foot nibbled on by a baby shark over the weekend! "A thousand people in the ocean and I get bit by the shark," Seacrest joked on his KIIS FM morning show. Ryan is fine after sustaining a bite from the baby shark -- and has a souvenir to go along with his story. Apparently, Seacrest's fishy friend left a tooth lodged into the "Idol" judge's foot when he chomped on it. 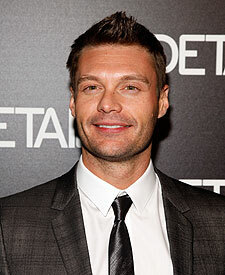 Click on an image to view the RYAN SEACREST photo gallery!